On this date in 1939, eight months before the armed forces of Nazi Ger­many surged over Polish borders to launch World War II in Europe, Ger­man Chan­cellor Adolf Hitler told Poland’s visiting Foreign Min­is­ter Józef Beck that Ger­many would guar­an­tee his coun­try’s fron­tiers were a “final settle­ment” reached over the status of the League of Nations-protected port of Dan­zig (today’s Gdansk), Poland’s outlet on the Baltic Sea. Hitler reminded Beck, who was meeting the Ger­man head of state at his palatial Berg­hof retreat on the Ober­salz­berg in Ba­va­ria, that Dan­zig had been a part of Prussia that had been lost in the victors’ peace following the First World War. Sooner or later, he said, Dan­zig—effec­tively a Ger­man-speaking out­post of the Third Reich sur­rounded by Poland—would again be part of Ger­many. 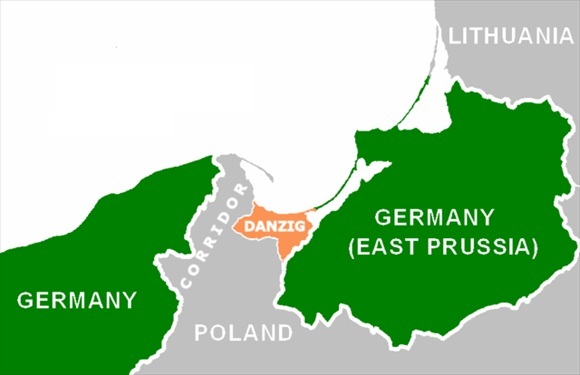 Beck rejected demands for Dan­zig’s return, and did so again on March 26, 1939, after Hitler had gra­tu­i­tously offered Slo­va­kia to Poland in ex­change for Dan­zig and Ger­man control of over­land routes between the Ger­man heart­land and East Prussia. (At Hitler’s urging Slo­va­kia had declared its inde­pen­dence from the Czech-speaking western part of Czecho­slo­va­kia days earlier, on March 14.) Beck rejected Hitler’s offer even against the saber-rattling back­drop of Ger­many’s March 23 occu­pa­tion of the for­mer East Prus­sian “Memel Terri­tory” (now Klai­pėda Region), which had been handed to Lithu­a­nia, Poland’s neigh­bor to the north­east, following the Great War. Poland’s hubris­tic and obtuse leader­ship was unable to fully appre­ci­ate the flash­point issues that con­sumed Hitler. So it was in­ev­i­table that Hitler should order con­crete pre­pa­ra­tions for an assault on Poland, selecting Septem­ber 1, 1939, as the start date. In the face of a wors­ening inter­na­tional situ­a­tion during the spring and sum­mer, Ger­man diplo­ma­tic feelers to Europe’s major capi­tals were a cover for plotting war, as Hitler re­marked to his gen­erals in May 1939. Dan­zig, he said, was not the real issue; it never was. The real issue “is an ex­pan­sion of Lebens­raum [living space] in the east,” meaning the Soviet Union. By solving “the Polish pro­blem,” Hitler told his inti­mates, he would “create a foun­da­tion for the un­avoid­able fight with Russia.” Hitler’s pro­blem-solving strat­a­gem back­fired hor­ri­bly when the leaders of Britain and France fully com­pre­hended the scale of Hitler’s con­ti­nen­tal am­bi­tions, declaring war on the incor­ri­gibly aggres­sive nation on Septem­ber 3, 1939. Above: Interwar land corridor to the Baltic Sea and the semi-autonomous “Free City of Dan­zig,” 1920–1939. Both creations were carved from former German territory (West Prussia) so that newly independent Poland would not be dependent on German ports for its import/­export trade. In May 1933 Hitler’s Nazi party gained control of the Danzig Senate. Like the ethnic Germans in Czecho­slo­vakia’s Sude­ten­land in the mid-1930s, Danzig’s large ethnic German community strongly agi­tated to be incor­porated into the Fatherland. 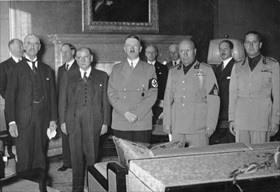 Left: Posing stiffly for posterity from left to right: British Prime Minister Neville Chamberlain, French Prime Minister Édouard Daladier, German Chancellor Adolf Hitler, Italian Prime Minister Benito Mussolini, and Italian Foreign Minister Galeazzo Ciano. Leaders of the four European powers signed the Munich Agreement on Septem­ber 30, 1938, which handed Czechoslovakia’s German-speaking Sude­ten­land to Germany. Chamberlain’s and Daladier’s mis­per­ception, mis­com­pre­hen­sion, and mis­judg­ment paved the way for Hitler’s repeated diplomatic successes in the late 1930s. 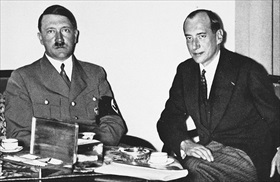 Right: Hitler and Polish Foreign Minister Józef Beck in 1937. Beck was the dominant figure in the Polish government and had been in the Polish Foreign Office since 1932. After Poland’s ambassador to Germany, Józef Lipski, had met with Hitler’s foreign minister, Joachim von Ribbentrop, on October 24, 1938, to hear the German suggestion that Danzig should be returned to Germany and a road-rail link be established across the Polish Corridor with extra-territorial rights for Germany over the route, Beck sensed that Hitler was set to embark on a “war of nerves” over Danzig. Exactly a month after that meeting, Hitler instructed the Wehrmacht to prepare a plan for seizing Danzig by force.